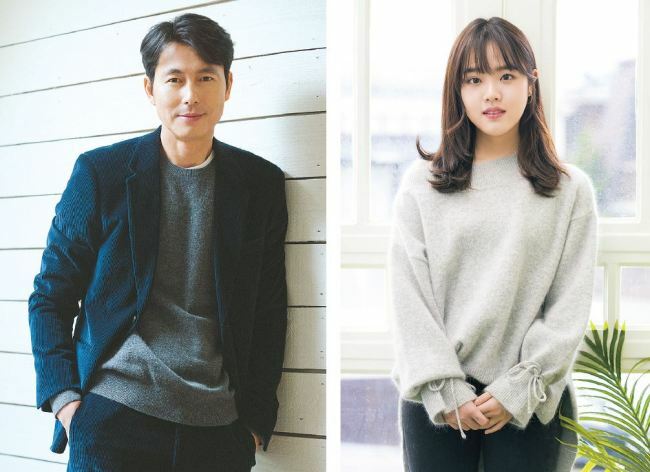 Veteran actor Jung Woo-sung and budding starlet Kim Hyang-gi have come together for a memorable performance in the upcoming drama “Innocent Witness” by Lee Han. The film is about a young girl with autism testifying in court about what she witnessed in a supposed murder, and her interaction with a lawyer caught between compromising with reality and doing the right thing. With the movie set for release on Feb. 13, the lead actors sat down for a group media interview to discuss their roles. The chemistry between the lawyer Sun-ho and the 15-year-old girl Ji-woo -- played respectively by Jung and Kim -- is the driving force of the film. Jung, with 25 years of experience, discussed how he portrayed the relationship with a girl with unique characteristics. The actor said he was backed by the director’s trust, saying that Lee was open to any form of expression he came up with. “He gave me confidence by saying ‘Jung Woo-sung is Sun-ho.’ He wanted Sun-ho’s struggles to be realistic and humane,” Jung said. In depicting the inner struggles, Jung said he tried not to overplay the emotions and to be calm as possible. “I thought this was a movie that shouldn’t force the main character’s emotions on the audience,” he said. Jung managed to put some color in his character and interactions with other people, mainly with Sun-ho’s father. “People living their daily lives do not really realize this, but the everyday conversations and the little quarrels have a certain warmth to them. ... This is also seen in Sun-ho’s efforts to communicate with Ji-woo, how he tried to get close to her,” he said. Jung stressed that the movie’s attitude toward autism focuses not on the condition itself, but on how people perceive people with autism. “The problem is not their presence, but how we treat them. We need to treat them with respect,” he said. Regarding his co-star, Jung said her eyes hinted at thoughts beyond her age. Working with her showed that she carefully deliberates her role and the possible impact it may have on society, which he noted was an ideal attitude as an actor. As part of creating her character, Kim worked with a family with a member who has autism, and studied characteristics of the condition. But these characteristics, Kim noted, were not the entire story. The character Ji-woo is smack in the middle of that crucial stage, and director Lee -- as he did with Jung -- encouraged the young actress to ease naturally into the role. “It (the shoot) was very relaxed and comfortable,” she said, adding that Jung had helped her get into character by casually cracking jokes and being friendly. While the director had the overall set-up, most of the scenes were completed on-site with active communication between staff and the cast. “He told me not to be hung up on a certain setting and to freely express what I wanted to say. The hand gestures and other details came out naturally on set,” said Kim. Rather than play someone with a condition, Kim said she tried to depict a unique individual. “Her senses are extremely heightened, so she perceives things differently in everyday life. Even making eye contact and casual conversation can spell trouble for her, as she sees things differently. I constantly pondered how the world would look to her,” she said. While her senses may work differently, Kim noted that Ji-woo is constantly thinking. This is what propelled her to stand up for what she believes is right near the film’s end. The young actress also talked about her own growth in the film industry, saying that accolades and praise from critics still feel unreal. She added that she tries not to feel pressured. “When I act, I don’t think about the results. I work for the joy of acting, and I do not want to feel pressured because it may have negative effects (on the result),” Kim said. The actress expressed hope that the film -- essentially one of communication -- would be a catalyst for people to view others with an open mind. “I hope they will be more open toward understanding (other people). It may be impossible to fully comprehend what other people are going through, but I believe the will to understand is a key to opening up and seeing things as they are,” Kim said.